It all started over a beer – as great ideas often do. From the formation of an idea to the formulation of an Eggnog Stout, the journey from home brew to brewery had begun. The home brewers were three mates: Michael ‘Govs’ McGovern, Dan Norris and Eddie Oldfield. And their brewery goes by the name Black Hops Brewing, a name laced with some irony given their mission to build a brewery could well be the least covert operation in Australia. Govs is an intelligent brewer who brings bags of experience from his time at Burleigh Brewing and current employer, Fortitude Brewing. Dan runs his own successful WordPress support startup company and has written two books covering entrepreneurship and content marketing. The third member of this trio is Eddie, and it was he who came up with the idea and the name – and who seems to know all the right people in all the right places. Since launching their first beer in 2014 – the aforementioned Eggnog Stout that was the spark for a Who Brews? feature on the site – they've set their sights on opening their own brewery on the Gold Coast and are recording every step of the way in a series of often enthralling and enjoyable podcasts offering unfettered access to a process more and more Australians are considering. "Operation Brewery" complements the blog they've kept on their website since day one. That blog has documented everything from how to make tap decals on the cheap to how to brew a commercial beer and their plans to open a brewery. 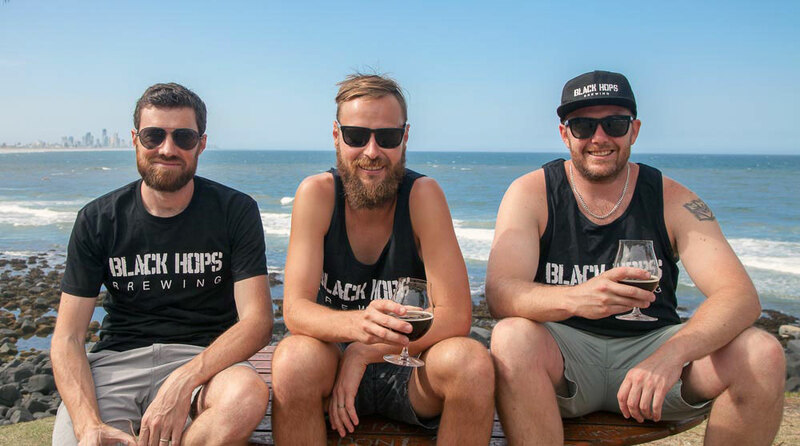 The transparency and honesty of Black Hops is refreshing and offers a candid insight into the hard work that goes on behind the scenes when conceptualising your own brewery. The reasons behind the blog and podcast are simple: it builds rapport with craft beer lovers and provides a gateway for people to get involved. They tell us it has caught the eye of people on both sides of the bar – as well as investors – and it also made the iTunes "New and Noteworthy" podcast list. And it has given their brand a loyal online following as well as the recognition necessary to generate interest – and the funds – for setting up a brewery. 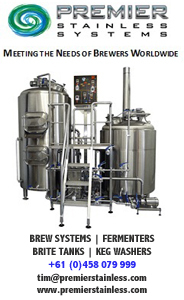 As of today, their physical brewery is a work in progress, with a custom-designed 20 hectolitre system and five fermenters purchased from China. In the meantime, the guys are contract brewing at Bacchus Brewing (pictured below) with their beers appearing regularly at the Gold Coast’s craftiest watering holes. So, when it arrives, where will this brewery be based? The guys are Gold Coast natives and strongly believe that the time is right to bring more brewing to the region, where they will join Burleigh and the forthcoming Balter. It's great news for beer lovers in South East Queensland who already enjoy access to a growing number of breweries in and around Brisbane and in Ipswich and Mt Tamborine. At the time of writing, the brewery site application is in the hands of the council; Black Hops – sticking to their digital media guns – will release all updates via their website. What we already know is that their proposed operation will include a cellar door that will serve up their original Eggnog Stout in addition to five other core beers. These include a "classic" Gold Coast pale ale, the Beach House Saison, and a mid-strength Californian Common labeled as 30 Cal; the last of these, like the brewery's name, is a clever nod to military terminology, the beer style and its 3.0 percent ABV. There are also plans to regularly supplement the cellar door with seasonal and specialty beer offerings. In the meantime, you can keep an eye out for a collaboration beer – an Indian black lager – which they brewed with Ipswich’s 4 Hearts Brewery. 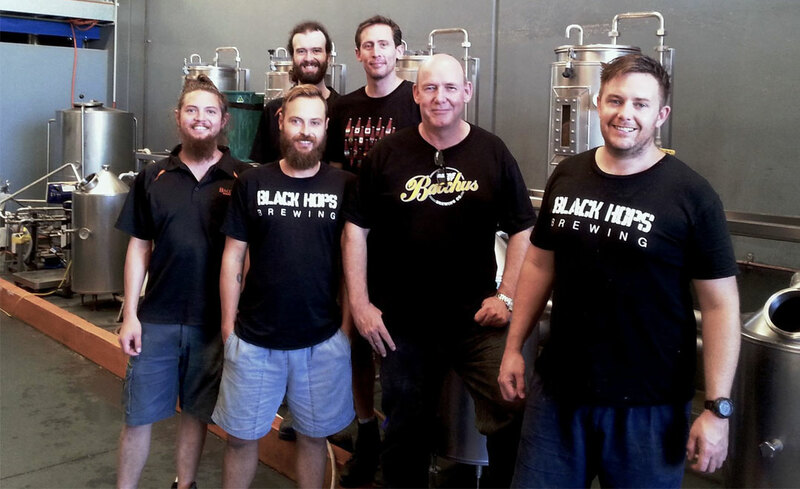 To hear more from Govs, Dan, Eddie and Operation Brewery, head to www.blackhops.com.au where the latest podcast is episode three: an interview with Steve Baxter from The Shark Tank television show. If you want to go one step further and meet the guys, then pencil in an event at Ze Pickle in Burleigh, where you can “Speed-Date a Brewer”. 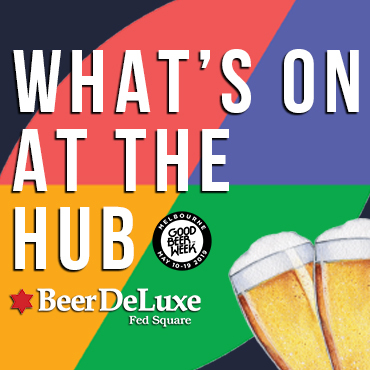 It's one of many events being held during "Free The Hops", Gold Coast’s first craft beer festival, which runs from October 15 to 25. Look out for more details in our Events Diary soon.